Sweden’s footballers held nothing back in celebrating their Russia 2018 World Cup qualification, which even saw them breaking a TV broadcast desk in two as they mobbed pitchside reporters. 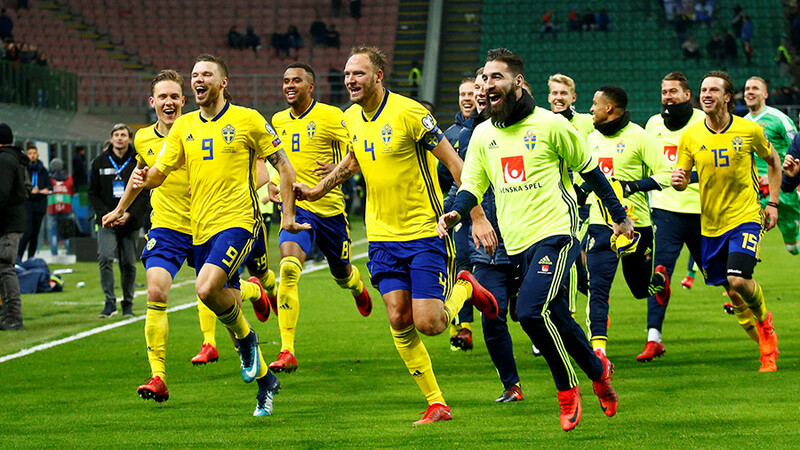 Sweden held Italy to a 0-0 draw at Milan’s San Siro on Monday to record a 1-0 aggregate victory and book their place in Russia next year. As the unsuspecting Swedish Eurosport team was wrapping up their broadcast beside the pitch after the game, the jubilant players channeled their excitement onto the crew. Entering from the left of the screen, the players sneak up and burst into the makeshift studio, mobbing the presenter and guests, forcing a cameraman to flee to safety and destroying the set in the process. Despite the destruction of their reporting quarters, the crew took the celebrations in good humor. Continuing the joyous scenes into the dressing room, ‘Blågult’ captain Andreas Granqvist then went through the bizarre ritual of having his teammates shave his head. Social media users were convinced that the Krasnodar midfielder was a dead ringer for teammate John Guidetti following his fresh cut. Italian goalkeeper and 2006 World Cup winner Gianluigi Buffon made headlines for his tears after the game; ‘Gli Azzurri’ great Buffon made his 175th and final appearance against Sweden, a European record. Italy substitute Daniele De Rossi was caught on camera angrily gesticulating with boss Gian Piero Ventura when asked to warm up in preparation to go onto the pitch. The Roma midfielder reportedly said, “Why the hell should I go on?” before gesturing to striker Lorenzo Insigne, whom he believed would make more of an impact with Italy needing a win. “It wasn’t up to me whether it was a tactical issue. I’m sorry if I offended anyone. At the time I just thought perhaps it was better that Insigne come on instead,” De Rossi later said. In the remaining playoff qualifier fixtures, Ireland takes on Denmark in Dublin, Peru plays New Zealand, Australia hosts Honduras. In Africa, Senegal plays South Africa after the result of meeting last November was annulled due to s refereeing scandal, and Burkina Faso takes on Cape Verde Islands.